Google is rolling out one of its biggest home page changes to date. The revamp strips its front page of the black bar that currently runs horizontally along its top, and replaces it with a grey logo. When clicked or highlighted, it reveals seven alternative services to the site's search page with an option to reveal a further eight. Analysts said the move was designed to promote more of the firm's businesses without cluttering its webpage. The new look,which was first announced last year, is only being offered to a limited number of users at the moment. 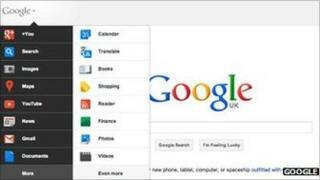 A spokesman for Google said that the roll-out is designed to improve the user experience. "Constant revision and improvement is part of our overarching philosophy," he said. "If you compare the original Google home page to today's version, you will see that a makeover every so often can certainly be refreshing." Chris Green, principal technology analyst at Davies Murphy Group, said the move allowed the site to use icons without resembling Yahoo's busier design. "They are trying to deal with how to service all the different Google properties without making the page cluttered, because Google is always very keen to hang onto the plain minimalist front page that they have always had," he said. "The other thing that they are doing with those menus is making the page look like their Chrome netbook operating system. "So whether you are using a Chromebook or the Google website the interface is the same." Another consequence of the move is that it now takes users two movements to enter services such as Images or News, rather than the one click that was previously needed. However, this may play to the site's financial advantage. "For years we've all been extolling the virtues of minimising the number of clicks and it would appear to be a retrograde step," said Mr Green. "But for the sake of clarity it's better having the extra click. What it also means is that, for most people, their first route into the Google universe will be back through the search bar again, which helps the firm expose more people to advertising. "Through search they can put adverts in front of you, while in the news section there isn't advertising." Google is facing scrutiny for the way its own services appear in its search results. Last month, two senators called on the Federal Trade Commission to investigate whether Google was exploiting the fact it had a majority of both search via PC and mobile devices. "A key question is whether Google is using its market power to steer users to its own web products or secondary services and discriminating against other websites with which it competes," Senators Herb Kohl and Mike Lee wrote. The Financial Times has also reported that theEuropean Commission was examining claimsthat Google "downgrades some rival websites in its search results, while playing up its own services". Google has denied deliberately disadvantaging rivals.